Ricky was stabbed near the lungs after he fought a robber. Upon assessment in the hospital, his trachea is midline yet he has diminished breath sounds. His chest expansion is decreased. He is agitated because he cannot breath properly. The physician diagnosed him with traumatic pneumothorax secondary to a penetrating chest trauma. Pneumothorax is one of the disorders of the chest and lower respiratory tract. Pneumothorax, or a collapsed lung, is the collection of air in the spaces around the lungs. The air buildup puts pressure on the lung(s), so it cannot expand as much as it normally. Pneumothorax occurs when the parietal or visceral pleura is breached and the pleural space is exposed to positive atmospheric pressure. The pressure in the pleural space is normally negative. A spontaneous pneumothorax occurs with the rupture of a bleb. An open pneumothorax occurs when an opening through the chest wall allows the entrance of positive atmospheric pressure into the pleural space. Diagnosis of pneumothorax is made by chest x-ray film. Simple pneumothorax. A simple or spontaneous pneumothorax occurs when air enters the pleural space through a breach of either the parietal or visceral pleura. Traumatic pneumothorax. A traumatic pneumothorax occurs when air escapes from a laceration in the lung itself and enters the pleural space or from a wound in the chest wall. Tension pneumothorax. A tension pneumothorax occurs when air is drawn into the pleural space from a lacerated lung or through a small opening or wound in the chest wall. Negative pressure. The negative pressure is required to maintain lung inflation. Breach. When either pleura is breached, air enters the pleural space. Collapse. When positive pressure has entered the pleural space, the lung or a portion of it collapses. The cause leads to the identification of the type of pneumothorax. Rupture of a bleb. A spontaneous pneumothorax may occur in an apparently healthy person in the absence of trauma due to rupture of an air-filled bleb. Blunt trauma. Blunt trauma like rib fractures could cause traumatic pneumothorax. Invasive procedures. Traumatic pneumothorax may occur during invasive thoracic procedures in which the pleura is inadvertently punctured. Penetrating chest or abdominal trauma. Trauma such as stab wounds or gunshot wounds could cause traumatic pneumothorax. The signs and symptoms associated with pneumothorax depend on its size and cause. Pain. Pain is usually sudden and may be pleuritic. Minimal respiratory distress. The patient may have only minimal respiratory distress with slight chest discomfort and tachypnea. Dyspnea. Due to pain, the patient has difficulty in breathing. Central cyanosis. The patient may develop central cyanosis from severe hypoxemia. Chest expansion. In simple and tension pneumothorax, the chest expansion is decreased. Breath sounds. Breath sounds are diminished or absent in both simple and tension pneumothorax. Tracheal alignment. In simple pneumothorax, the trachea is midline while in tension pneumothorax, the trachea is shifted away from the affected side. Thoracic CT: Studies show that CT is more sensitive than x-ray in detecting thoracic injuries, lung contusion, hemothorax, and pneumothorax. Early CT may influence therapeutic management. Chest x-ray: Reveals air and/or fluid accumulation in the pleural space; may show shift of mediastinal structures (heart). ABGs: Variable depending on degree of compromised lung function, altered breathing mechanics, and ability to compensate. Paco2 occasionally elevated. Pao2 may be normal or decreased; oxygen saturation usually decreased. Thoracentesis: Presence of blood/serosanguineous fluid indicates hemothorax. Hb: May be decreased, indicating blood loss. Medical management of pneumothorax depends on its cause and severity. Chest tube. A small chest tube is inserted near the second intercostal space to drain the fluid and air. For patients with jeopardized gas exchange, chest tube insertion may be necessary to achieve lung re-expansion. The priority is to maintain airway, breathing, and circulation. The most important interventions focus on reinflating the lung by evacuating the pleural air. Patients with a primary spontaneous pneumothorax that is small with minimal symptoms may have spontaneous sealing and lung re-expansion. Maintain a closed chest drainage system. Be sure to tape all connections, and secure the tube carefully at the insertion site with adhesive bandages. Regulate suction according to the chest tube system directions; generally, suction does not exceed 20 to 25 cm H2O negative pressure. Monitor a chest tube unit for any kinks or bubbling. These could indicate an air leak, but do not clamp a chest tube without a physician’s order because clamping may lead to tension pneumothorax. Autotransfusion. Autotransfusion involves taking the patient’s own blood that has been drained from the chest, filtering it, and then transfusing it back into the vascular system. Antibiotics. Antibiotics are usually prescribed to combat infection from contamination. Oxygen therapy. The patient with possible tension pneumothorax should immediately be given a high concentration of supplemental oxygen to treat the hypoxemia. If more than 1500 ml of blood is aspirated initially by thoracentesis, the rule is to open the chest wall surgically. Thoracotomy. The chest wall is opened surgically to remove the blood or air trapped in the pleural space. Nursing management of a patient with pneumothorax include the following steps. Acute pain related to the positive pressure in the pleural space. Ineffective breathing pattern related to respiratory distress. Ineffective peripheral tissue perfusion related to severe hypoxemia. Anxiety related to difficulty in breathing. Adherence to prescribed pharmacological regimen. Establishment of a normal, effective respiratory pattern as evidenced by absence of cyanosis. Demonstration of increase in perfusion. Be relaxed and report anxiety is reduced to a manageable level. Reexpansion. The patient is instructed to inhale and strain against a closed glottis to reexpand the lung and eject the air from the thorax. Sterile covering. The opening is plugged by sealing it with gauze impregnated with petrolatum. Oxygen saturation. Pulse oximetry is used to monitor oxygen saturation. Adhered to prescribed pharmacological regimen. Established a normal, effective respiratory pattern as evidenced by absence of cyanosis. Patient is relaxed and reported anxiety is reduced to a manageable level. Asepsis. The site of incision should be handled aseptically to avoid occurrence of infection. Medications. Medications prescribed such as analgesics and antibiotics should be taken religiously. Follow up. Follow up appointments should be attended to allow the physician to assess the surgical site and the state of your respiratory system. Activity. Alternate rest and activities to avoid over exhaustion and difficulty in breathing. Respiratory pattern, breath sounds, use of accessory muscles. Use of respiratory aids or supports. Nature, extent, and duration pf the problem. Description of feelings (expressed and displayed). Awareness and ability to recognize and express feelings. Response to interventions, teachings, and actions performed. Modifications to the plan of care. D: The patient experiences chest discomfort and tachypnea initially. A: The patient does not experience ARDS initially in a simple pneumothorax. B: The patient does not experience severe respiratory disease initially in a simple pneumothorax. C: The patient does not experience sudden onset of chest pain initially in a simple pneumothorax. C: Acrocyanosis is not a sign of pneumothorax. A: Pleuritic pain is a clinical manifestation of pneumothorax. B: Respiratory distress is a clinical manifestation of pneumothorax. D: Tachypnea is a clinical manifestation of pneumothorax. Which of the following should the nurse assess in a patient with pneumothorax? D: All of the options listed should be assessed by the nurse in a patient with pneumothorax. A: Tracheal alignment should be assessed in a patient with pneumothorax. B: Expansion of the chest should be assessed in a patient with pneumothorax. 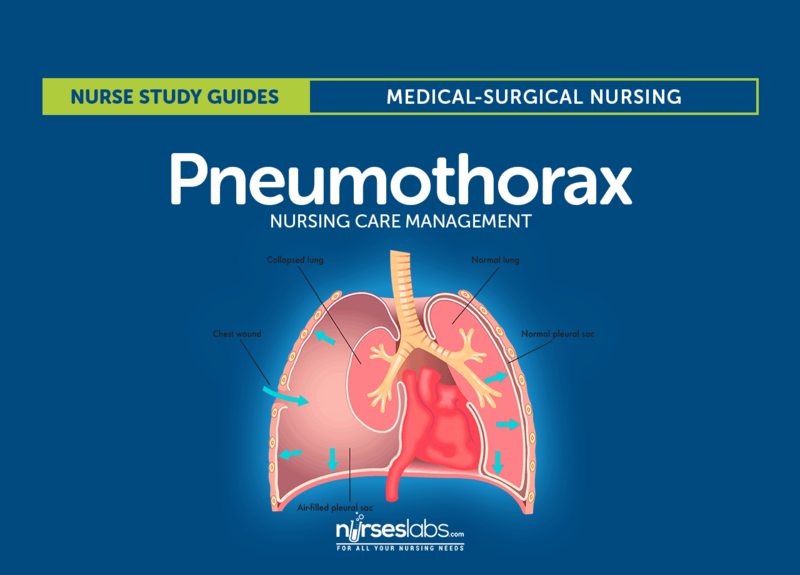 C: Breath sounds should be assessed in a patient with pneumothorax. B: The pressure in the pleural space is normally negative to maintain lung inflation. A: Positive pressure in the pleural space leads to pneumothorax. C: Atmospheric pressure in the pleural space leads to pneumothorax. D: Not all of the options are correct. D: There is no direct type of pneumothorax. A: Trauma pneumothorax is a type of pneumothorax. B: Simple pneumothorax is a type of pneumothorax. C: Tension pneumothorax is a type of pneumothorax. C. Sudden onset of chest pain. D. Tachypnea and chest discomfort. 3. Which of the following should the nurse assess in a patient with pneumothorax? B. Expansion of the chest. 1. Answer: D. Tachypnea and chest discomfort. D: The patient experiences chest discomfort and tachypnea initially. A: The patient does not experience ARDS initially in a simple pneumothorax. B: The patient does not experience severe respiratory disease initially in a simple pneumothorax. C: The patient does not experience sudden onset of chest pain initially in a simple pneumothorax. C: Acrocyanosis is not a sign of pneumothorax. A: Pleuritic pain is a clinical manifestation of pneumothorax. B: Respiratory distress is a clinical manifestation of pneumothorax. D: Tachypnea is a clinical manifestation of pneumothorax. D: All of the options listed should be assessed by the nurse in a patient with pneumothorax. A: Tracheal alignment should be assessed in a patient with pneumothorax. B: Expansion of the chest should be assessed in a patient with pneumothorax. C: Breath sounds should be assessed in a patient with pneumothorax. B: The pressure in the pleural space is normally negative to maintain lung inflation. A: Positive pressure in the pleural space leads to pneumothorax. C: Atmospheric pressure in the pleural space leads to pneumothorax. D: Not all of the options are correct. D: There is no direct type of pneumothorax. A: Trauma pneumothorax is a type of pneumothorax. B: Simple pneumothorax is a type of pneumothorax. C: Tension pneumothorax is a type of pneumothorax.